Headline news for this week has been the arrival at Preston of the main components for former Furness Railway 0-4-0 No. 25, more recently known as Barrow Haematite Iron & Steel Co. 0-4-0ST No. 17. 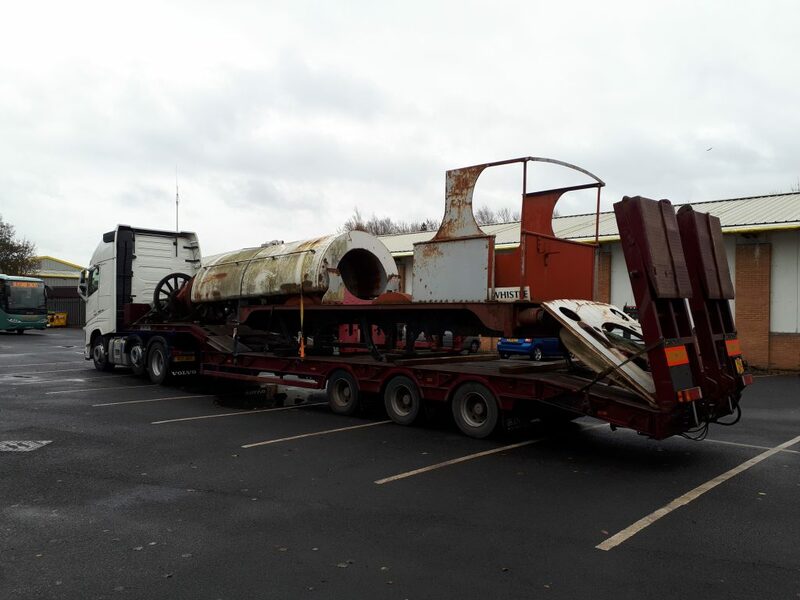 As has been recounted previously in the blog, smaller items for the locomotive have been retrieved from Derby and Crewe, and the boiler components brought down from Stockton-on-Tees. 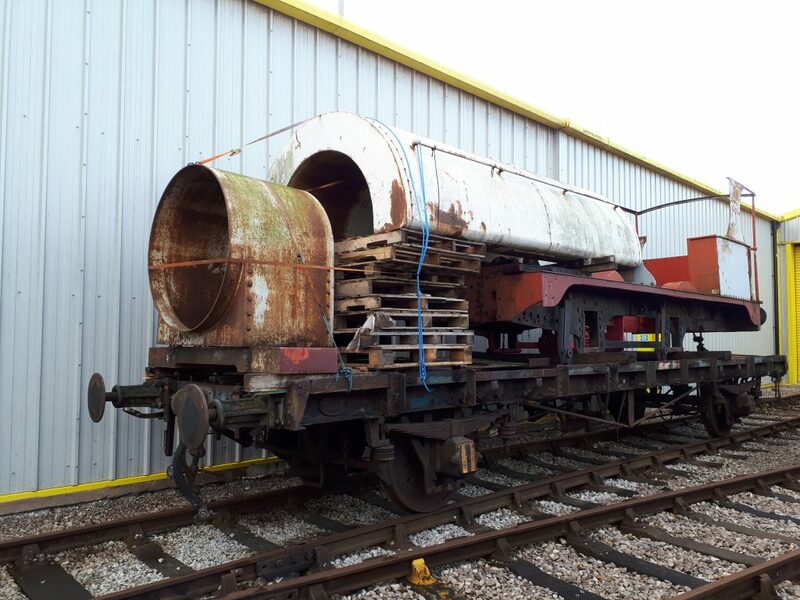 However, it has been necessary to do rather more preparation before the Trust could receive the frames, cab, tank and wheels from storage at Carnforth. However, with the formal swapping of the FRT’s PMV with the RSR’s CCT and the removal of the body from the latter, the scene was set for the arrival of FR 25 last Wednesday morning. 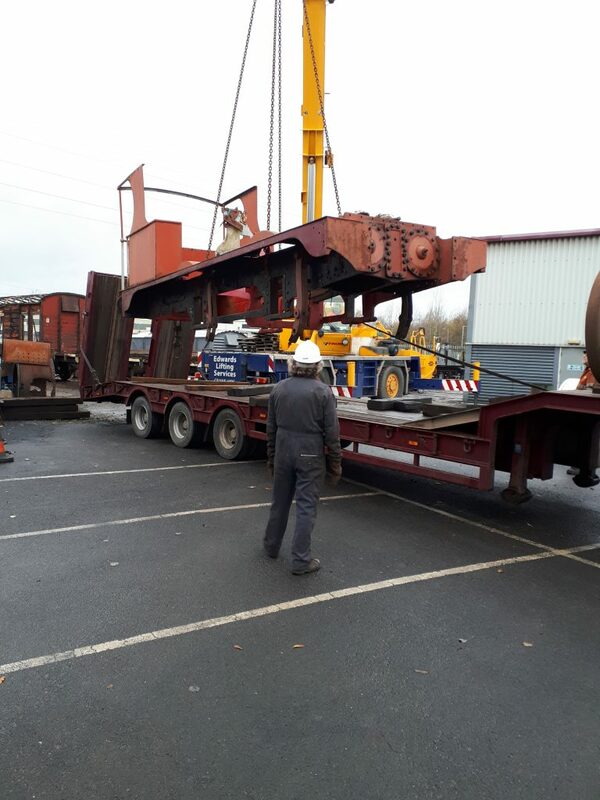 Fortunately, all the planning and preparation paid off and the locomotive’s parts were safely offloaded from Martyn Soames low loader by a road crane and then secured on to the CCT frames. The CCT was subsequently, on Thursday, moved around to stand outside the FRT’s shed, forming a queue for attention no doubt! In the meantime, work has continued to clean FR 20’s frames, wheels and motion on both Wednesday and Friday. 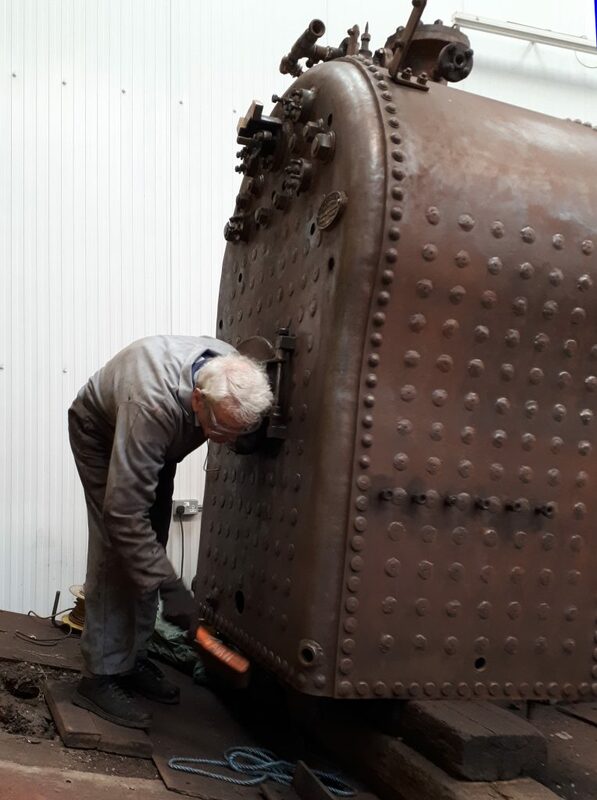 Fred has now finished wire brushing the firebox and has made a good start on the boiler. Paul Balshaw and John Davis completed the removal of the cantrail from GER No. 5 on Wednesday and the next stage will be to start the removal of the roof fittings. This is all in preparation for new roof canvas to be fitted. We received a visit on Wednesday from a safety systems company who can supply a safety wire for the use of those working at height. There are a couple of options for the Trustees to consider. 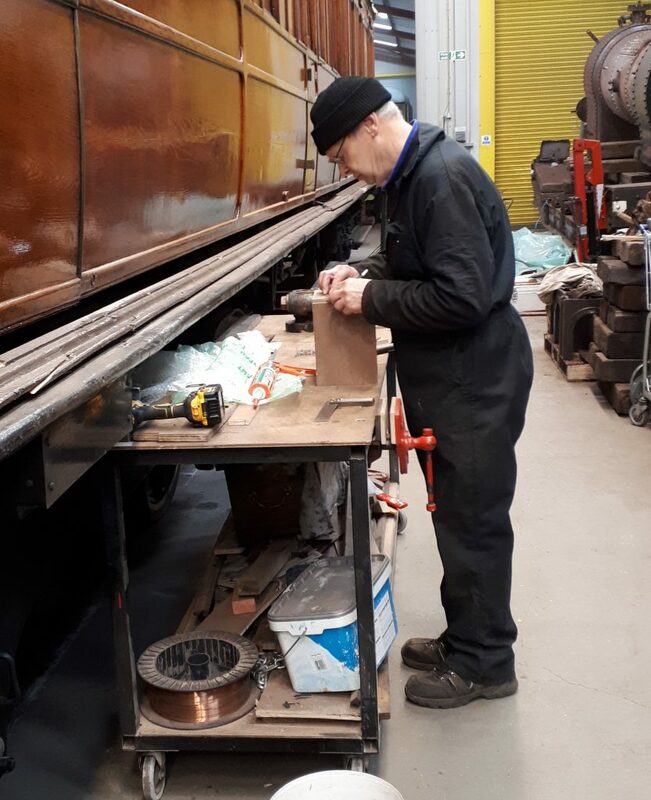 One of Cumbria‘s clack boxes has been brought back from Embsay and John Dixon has spent some time making a box so that it can be despatched for repair. Alan tells us that he is now in the final throes of preparing the next edition of The Iron Horse which it is hoped will be sent out around Christmastime. Yet another riveting session on Wootton Hall‘s tender frames took place last Thursday, but there is likely to be a short break now whilst suitable wedges are brought in to enable the more awkward rivets to be fitted; this is in hand. Finally, the RSR’s Santa Trains, which have been fully booked for some weeks, got off to a good start on Saturday and Sunday, with Alan and Tim reprising their roles as musical elves, Alison and Jen operating the FRT’s sales stand, and on Sunday Neil wielding the shovel on Courageous.